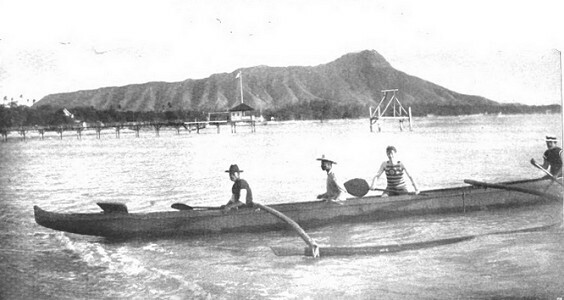 Walter B. Townsend : Surf-board and Outrigger at Waikiki, 1899. Introduction by Major-General Joseph Wheeler. Edited and arranged by William S. Bryan. 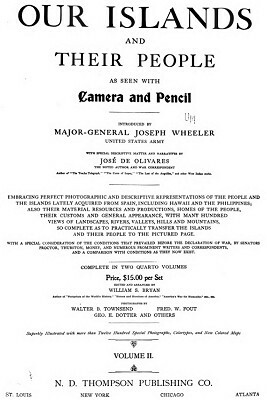 Photographs by Walter B. Townsend. N.D. Thompson Publishing Co., St. Louis, 1899. This source was identified by Herve Manificat and posted on the Surf Blurb, 24 April 2013. The on reference in the text to surfriding are the captions to the photographs. The "artist" (author? 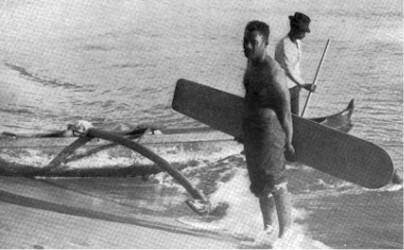 ), José de Olivares, is pictured in the stripped top in the outrigger canoe. Note the free-standing construction off the end of the Moana Pier, possibly installed to shoot photographs.. The board portrait by Townsend is rare and, unlike similar contemporary images by James J. Williams and Frank Davey, has only occasionally been reprinted. It appears in Malcom Gault-Williams: Legendary Surfers (2005) on page 223, with the caption "Waikiki surfer at the turn of the century." The photographer and the original source are unaccredited. Note that the surfer in this image is wearing shorts, whereas the other two are depicted in the traditional malo. As this garment was unlikely to be in use at this time, it was probably employed by the other photographers as a prop to enhance "traditional" authenticity. For comparison, the other images are reproduced below. perfect safety into rough seas that would be dangerous to any ordinary craft. Our artist, who handles one of the paddles, has just returned from the exhilarating sport of a surf ride. The native sits or stretches full length on the board and rides the surf with perfect ease and safety. in the use of these boards that they have been known to ride the surf for a distance of half a mile or more. Geoff Cater (2013-2017) : Walter B. Townsend : Surf-board and Outrigger at Waikiki, 1899.